Does your online marketplace need a payments licence? Since the growth of online marketplaces such as eBay, many e-tailers have established themselves as successful players in this market – including more segmented operators like Asos.com. The growth in these business models is only set to increase with venture capitalists looking to invest in such businesses which provide large margins as they are built to scale and continue to grow. Under PSD1 there is an exclusion which has been sought to be relied upon by some e-commerce marketplaces that intermediate payments between its customers – to avoid them from requiring a payment institution licence. 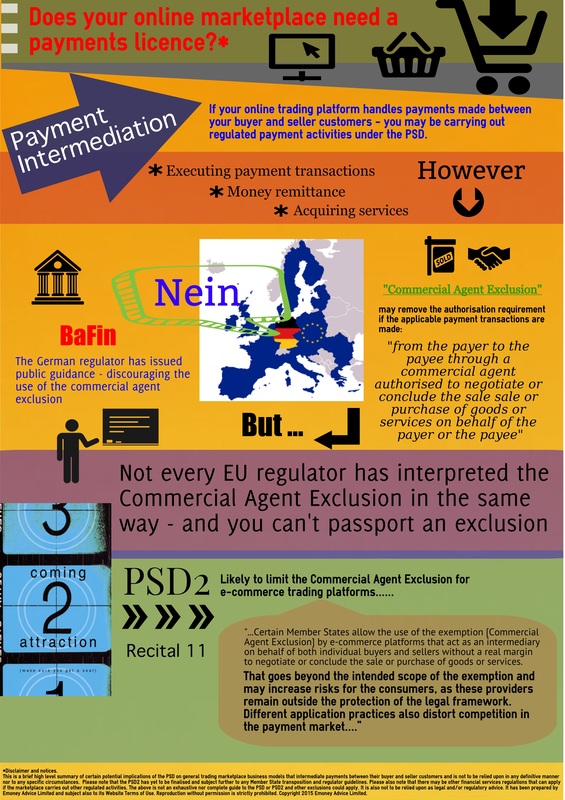 The exclusion is made available for payment transactions carried out from the payer (typically a buyer) to the payee (a seller or merchant) through a commercial agent (the marketplace operator) authorised to negotiate or conclude the sale or purchase of goods or services on behalf of the payer or the payee (Article 3(b) of PSD1 – referred to as the “Commercial Agent Exclusion”). The Commercial Agent Exclusion provides that the intermediary such as the marketplace operator only need to be a commercial agent to negotiate *or* conclude sales (and not necessarily both). The existing scope of this exclusion would seem to apply to e-commerce marketplace providers who, by setting up their business operations to act as a commercial agent with their customers, can process their transactions on their behalf. Such a structure also typically provides for the sender of funds (typically a buyer) to extinguish their debt to the ultimate recipient of those funds (the seller) upon the commercial agent’s receipt of those funds. Even though many marketplaces have sought to rely on the Commercial Agent Exclusion, not every EU regulator has accepted it for this purpose. In particular, the German regulator, BaFin has issued public guidance discouraging its use. Consequently there is discrepancy across the EU as to an operator relying upon this exclusion. The key distinction made here is that the commercial agent can only be an agent of either the payer or the payee (and not both as is permitted under PSD1). The mention in the above recital to the inappropriate use of the commercial agent exclusion by e-commerce platforms gives the impression that such operators are not to generally take advantage of the exclusion and for the added reason that they do not allow: “a real margin to negotiate or conclude the sale or purchase of goods and services”. It appears that the ‘real margin’ factor has become an important one to determine whether the exclusion is available but it is not reflected in the wording of the draft revised exclusion itself. This creates a great deal of uncertainty as to what exactly is the test to be applied or, in fact, is it the case that no typical e-commerce marketplace provider can take advantage of the exclusion unless they don’t come into possession of the funds at all? The approach taken by PSD2 still leaves open questions and it cannot be demonstrated to nurture innovation in this space. It is hoped that the exact scope of the commercial agent exclusion will be clarified in the transposition of the PSD2 into national Member State law / regulator guidance. (Note: the above is a high level review of certain potential issues and is not to be relied upon in any definitive manner nor for any specific circumstances. It is not a complete analysis of the issues and does not constitute legal and/or regulatory advice. References to PSD2 are references to draft versions of the directive which may not reflect the final adopted version). advisor, pay, payment, payment services, payment services directive, Payments, PSD, PSD2 permalink.